For this recipe buy the free-range pork tenderloin from the service meat counter, although tenderloin is also available pre-packed. An ideal dish for entertaining served with polenta mixed with Parmesan cheese. Cut incisions along the pork tenderloins, approximately 1.25cm apart, from the top to the bottom, but do not cut all the way through. In a small bowl, mix together the mascarpone, lemon rind, sage and seasoning. Fill the pockets with half of the mascarpone mixture, then wrap the pork with Parma ham. Place the tenderloins in a small roasting tin and roast in a preheated oven 200ºC, gas mark 6, for 30 minutes. Remove the tenderloins and allow to stand while making the sauce. Place the roasting tin over a medium heat and add the remaining mascarpone mixture with the lemon juice. Stir until well combined and heated through. 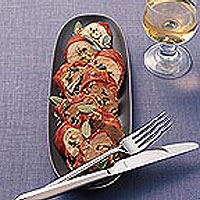 Cut the pork into slices, pour the sauce over the top and garnish with sage leaves. To make pork in a pastry crust, heat 1tbsp oil in a frying pan and seal the tenderloins. Cut 375g packet Saxby's Ready Rolled Puff Pastry in half, place a tenderloin in the centre of each and brush the pastry edges with beaten egg. Divide 100g soft goat's cheese between the tenderloins and spread with pesto, made in a food processor from 3tbsp olive oil, 2tbsp each of freshly chopped basil, parsley and toasted chopped hazelnuts (or use ready made pesto). Fold the pastry to seal and brush with beaten egg. Bake as above for 20 minutes then reduce the heat to 180C, gas mark 4 for a further 20 minutes.